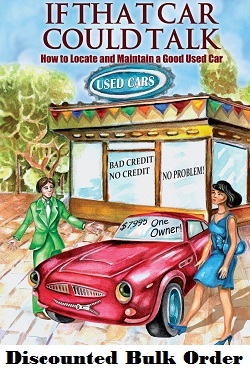 Judy R.Asks: I think I have a small exhaust leak in may car. How can I check it? Judy asked me this question because she has owned her car for quite some time now, and knows what it usually sounds like. She told me that her car sounds louder than normal ,but her mechanic says that he is unable to find a leak anywhere in her cars exhaust system. To start off with biggest concern here is carbon monoxide entering the passengers compartment. As may already know carbon monoxide is a colorless odorless gas that can be fatal and any exhaust leak small or big should be taken seriously and fixed as soon as possible. As far as noise is concerned this is what may be going on if no leak is detected. With her car she informed me that it has over 130 K miles on it and it has the original muffler and I suspect that the internal baffle system in the muffler may simply be worn out. The only fix for this would be to replace the muffler,with that said I would recommend that you go with an OEM factory replacement part. Why a factory replacement part? You get what you pay for and pay for what you get, especially if you go for the cheapest aftermarket replacement muffler you can find. Aftermarket exhaust systems are usually louder and they do not last very long at all, so spend a little extra and get a muffler that is a perfect match for your vehicle. The exhaust system and muffler that came with your vehicle was designed to be a perfect match for your engine by giving the proper amount of back pressure and heat transfer as needed. Now getting back to Judy’s original question how she can check for an exhaust leak herself. Here is a couple of tricks I can share with you. If you live in a cold climate and it is winter time, take a look under the car while it is running in neutral or park with the parking brake applied of course. See if you can the hot exhaust/steam escaping near the area that you suspect the leak is coming from. The other trick can be done in any climate hot or cold, put on a pair of gloves start the car cold and take an ordinary tennis ball and momentarily plug up the tailpipe with it. If the exhaust system it tight and not leaking exhaust pressure will build up against the ball and the engine may slow down a bit . If you hold the tennis ball up to the tailpipe and no resistance is felt and you can hear exhaust leaking, you know you need some exhaust work. Having an assistant look underneath the car is very helpful to try and pinpoint the area of leakage. 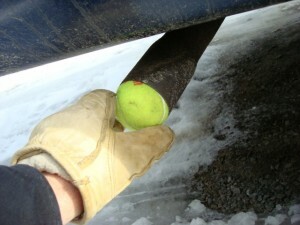 Ordinary tennis ball being used to try and detect an exhaust leak. Please note that if you have dual exhaust or chrome tips or an angle cut exhaust tip it may not be possible to check your system for a leak with a tennis ball. If you have a tailpipe opening that is too large for a tennis ball, you will obviously need a bigger ball to check for a leak. Exhaust leaks need to be taken seriously and should be diagnosed by a professional if you have any doubt in your mind, get a second opinion if needed. Judy thank you for your question, I hope this info helps you. « What does my car starter look like?